On Good Friday, we walk the way of the cross with Jesus, and witness the service of Simon of Cyrene (Mark 15:21). Simon was pressed into service to help Jesus carry the cross. It may not have been willing service. In fact, Simon may have regarded himself as being in the wrong place at the wrong time, yet serve he did. After the Crucifixion, Joseph of Arimathea goes to Pilate and asks for Jesus’ body so that he may bury him in his own tomb (John 19:38). Mary Magdalene, Mary, the mother of James, and Salome hurry to the tomb as soon as the Sabbath is over in order to anoint Jesus’ body (Mark 16:1). These, too, are examples of service. Most of us understand that we need to be of service to others. Sometimes, like Jesus, we do so willingly. Other times we are more like Simon of Cyrene and perform our duty somewhat reluctantly, perhaps even with a tad bit of resentment. Still, we serve. If we are serving, however, then someone else is being served. In Scripture, Jesus not only serves. When He is in need, He allows himself to be served. If you are anything like me, you might find that to be the harder part of the serving equation. I am happy to serve (at least most of the time). I try to do what I can to help other people. I find it incredibly difficult, on the other hand, to allow someone else to serve me. 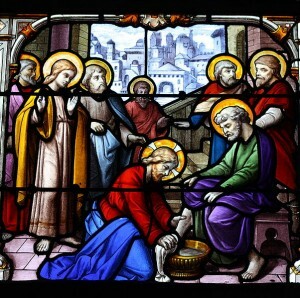 I am much more like Peter at the Last Supper, protesting to Jesus, “You will never wash my feet” (John 1:8). I have gotten a little better with age. I’m still reluctant to ask for help, but if it is offered, I do try to accept gracefully. I have come to understand that other people need to serve as well, and sometimes it is okay if I am the beneficiary of that service. Indeed, I am thankful for it. We all need each other in this world. As important as it is to serve, it is also important to allow oneself to be served. Sometimes, that can be the harder lesson to learn. Patrice Fagnant-MacArthur has a Master of Arts degree in Applied Theology from Elms College. A former Senior Editor at Catholic Lane, she is now the editor of Today's Catholic Homeschooling. She is also the author of The Catholic Baby Name Book and Letters to Mary from a Young Mother. She has two biological sons and one adopted daughter. Visit her blog at http://spiritualwomanthoughts.blogspot.com. Where Did You Find God Today? Are You “All In” When It Comes to Your Catholic Faith?